The first hundred years of the Rideau Canal saw it serving primarily as a commercial waterway. This has been well documented in a Parks Canada manuscript report by Edward F. Bush, titled “Commercial Navigation on the Rideau Canal, 1832-1961.” This manuscript report is the latest one to be digitized by Friends of the Rideau and released as a Book on CD (see details below). On May 22, 1832, the side paddles of Robert Drummond’s 80 foot long steamboat “Pumper”, renamed “Rideau”, started to turn under the power of its 12 hp steam engine. It was about to begin the first transit of the Rideau Canal, from Kingston to Ottawa. This wasn’t actually the first commercial voyage, the passengers on board, which included Lt. Colonel John By and his family, were not paying passengers. However, the Pumper/Rideau was also the first commercial vessel to transit the Rideau Canal when it left Kingston on July 12, 1832 with a load of 200 barrels of flour and 60 barrels of pork, together with a number of passengers. The early vessels that plied the Rideau were steamboats, paddle wheelers with either side or rear paddles. The screw propeller had only recently been invented and wouldn’t show up on the Rideau until the 1840s. The early steamboats were multi-purpose vessels, they carried cargo and passengers and also acted as tow vessels. Initially they towed the standard non-powered vessels of the day, durham boats and batteaux. These towed vessels not only carried various types of goods, they carried people. Thousands of immigrants traversed the Rideau Canal in the 1830s and 1840s, many in these small open barges that were towed by paddle wheelers. While more affluent passengers enjoyed the comforts of a cabin on a steamboat, many immigrants had to make do on the deck of a steamboat or in these small open barges. It wouldn’t have been a pleasant trip. on their way to the steamboat “Bytown” for a tow to the next lock (Jones Falls). In addition to moving people, an important aspect of the commercial use of the Rideau Canal was moving bulk goods. This included such things as minerals, potash, wheat, cheese, alcohol (barrels of beer, cider and whisky), food (barrels of salt pork, peas, etc. ), cordwood, sawn timber and later, coal. Entrepreneurs such as Robert Drummond were quick to make use of this new navigable waterway. Companies such as the Ottawa-Rideau Forwarding Company were formed with shareholders taking the risks and rewards of commercial navigation on the Rideau Canal. There were several mishaps with steamboats on the Rideau Canal. The Rideau was built as a slackwater system and the dams that drowned rapids also drowned forests, creating a large number of navigation hazards, the stumps of those drowned trees. The first recorded ship to sink on the Rideau was the Thomas McKay, when, on her last run of the 1835 season, she hit a stump just outside of Merrickville and sank in five feet of water. Her cargo was recovered and she was later raised and put back into service. Many of the steamboats were purpose-built for the Rideau Canal. While Kingston was the most prolific shipyard, there were many spots along the Rideau such as Dog Lake, Bedford Mills, Westport, Smiths Falls and Kemptville where ship and barge building took place. These vessels burned wood as fuel. Locals engaged in a brisk business of supplying wood to both to the steamers and to communities such as Kingston. The conversion to coal happened in the late 1800s as wood ran out (forests cut down) and coal became the less expensive option. Boats became more specialized as time went on. Passengers were demanding more comfort and a speedier trip. This led to multi-decked steam boats that didn’t do any barge towing. A dedicated work vessel, the steam tug, started to be used to tow large (up to 110 feet long by 30 feet wide) unpowered barges. Barges themselves became powered so that they could make the transit of the Rideau Canal on their own. The first luxury passenger steamer was the 69 foot long by 15 foot wide Rideau Belle, built at Kingston by Robert Davis in 1885. It was powered by a 20 hp steam engine. The Rideau Belle was designed for the comfort of the passenger. It featured cherrywood panelling in the dining room and staterooms, the ceilings were painted sky blue, curtains of green velvet covered the windows, and satin cushions topped the settees and sofas. She met her end in 1895 by burning to the waterline in Sand Lake. As a side note, the lockmaster at Chaffeys Lock salvaged some of the cherrywood panelling to build an outhouse. By the 20th century, a need was perceived for government patrol vessels. The first of these was the Ella C, a small (37 feet long by 9 feet wide) vessel built in 1906, powered by a 1 hp engine, and used for fishery patrols. In August 1907 the Department of Railways and Canals launched a much more powerful patrol boat, the 77 foot long Loretta powered by a 13.5 hp steam engine. She carried a crew of five (Captain, engineer, two deckhands, cook) and had a well-appointed stateroom for the use of the canal superintendent. In 1913 the Loretta was joined by another patrol vessel, the Agnes P. (56 feet long by 13 feet wide). 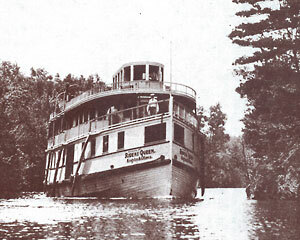 The Loretta served on the Rideau until 1958, the Agnes P. until 1963. It’s a common misconception that the coming of the railroads in the late 1800s led to the demise of the commercial use of the Rideau Canal. It didn’t, since much of the commercial trade on the Rideau was better suited to barges than it was to trains. Coal from the U.S. arrived on boats in Kingston and was offloaded onto barges for shipment to Smiths Falls and Ottawa. When timber ran out on the Rideau in the late 1800s, it was still a viable trade from the Gatineau hills and the upper Ottawa River, being loaded onto barges in Ottawa to ship to Kingston and from there to U.S. markets. Local products such as minerals and cheese continued to use barges on the Rideau as inexpensive bulk shipping into the 20th century. And the passenger trade flourished with the palace steamers operating into the 1930s. All of this and much more is well documented in our new Book on CD, Commercial Navigation on the Rideau Canal, 1832-1961. The Rideau King and a steam barge at Tett’s wharf and warehouse in Newboro in 1910. This summer we hope for warm dry days for the following events, as we plan to be present and meet many members of the Friends and recruit even more friends. Our AGM will be held on Saturday, May 11, in the theatre of the Rideau Canal Visitor Centre (former Rideau Canal Museum). This year will feature a talk by Darlene Upton, the Executive Director of Parks Canada’s new Waterways unit (see article on page 5). Darlene is in charge of both the Ontario Waterways and Québec Waterways units of Parks Canada. Given the changing times for the Rideau Canal this promises to be a very interesting talk. Our AGM is also a great opportunity to come out and meet the directors and members of Friends of the Rideau. We share a common love of the Rideau Canal so there is no lack of interesting conversation. We’ll also have coffee and tea on hand and Rowena’s famous carrot cake! It has been an interesting winter in terms of developments affecting the Rideau Canal and the level of public attention the Canal has attracted over the last several months. Since the last issue of our newsletter the full extent of the cuts to the budget of the Rideau Canal has become evident, as has the impact of the decisions by Parks Canada to dramatically increase the revenues from Canal use as of the 2014 navigation season. Of particular concern, discussed in the Fall/Winter newsletter, is the reduction of the presentation of the heritage of the Rideau to visitors who come to see an historic canal in operation and to learn about the place it occupies in the history of Canada. Also as a consequence of the budget cuts, the Friends of the Rideau Board notes with sadness the departure of many Rideau Canal staff with whom we have worked for many years and who shared our passion for the heritage of the Rideau. After several months of uncertainty, the key positions of Director of the Rideau Canal (together with the Trent-Severn) and Executive Director of Heritage Waterways, responsible for Ontario and Québec historic canals, have been filled. We have had the opportunity to meet Jewel Cunningham, Director of the Rideau Canal, and Darlene Upton, Executive Director of Heritage Waterways, and have told them of our concerns regarding heritage protection and preservation on the Rideau. They have inherited major challenges and we have let them know that we are willing to be a committed partner with Parks Canada, while reiterating our concerns for the protection and presentation of the heritage of the Rideau Canal. Elsewhere in this newsletter there is an invitation to the Friends annual meeting which will provide the opportunity to meet both Darlene and Jewel and have an opportunity to share concerns and ideas with them. I’m sorry to report that Friends has never received replies to our letters in 2011 and 2012 to the Honourable Peter Kent, Minister responsible for Parks Canada, urging him to preserve adequate budgets for Rideau Canal operations to ensure that the heritage of the Canal is maintained and that visitors are welcomed and their interest in the Rideau is encouraged. As I write, the ice on the Rideau Waterway is breaking up – at last! – and we can look forward to another season on and along the water. Let’s hope for a warm summer with good water levels; the directors of the Friends hope to see many of you at the various events along the Rideau and at the Depot in Merrickville. 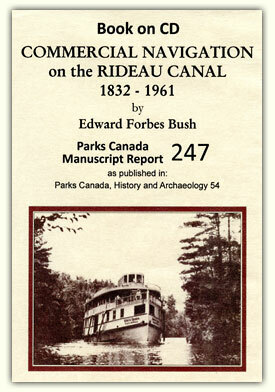 Friends of the Rideau is pleased to announce the completion of another Book on CD – this one titled “Commercial Navigation on the Rideau Canal, 1832-1961.” This 276 page Parks Canada manuscript report was written by Edward Forbes Bush and published in 1981. The report looks at all aspects of the commercial use of the Rideau Canal. This is the 11th report digitized by Friends of the Rideau. The report is broadly broken out into three sections. The first section looks at the evolution of the steamboat, the first boats to commercially ply the Rideau Canal. Many of those used on the Rideau were locally built, initially side or rear paddle wheelers and then screw propeller vessels. They were powered by a variety of steam engines. In addition to steam boats, many barges were used (most locally built), initially unpowered and later self-powered. Many were purpose-built for the Rideau, designed to the maximum dimensions of a Rideau lock. The second part of the report looks at the operation, facilities and regulations concerning commercial navigation. This includes information on the various tolls charged to commercial operations and the battles with mill owners discharging sawdust and other debris into the canal. The third part summarizes the Rideau carrying trade during different periods from the early forwarders such as Robert Drummond to the later period with companies such as the Rideau Lakes Navigation Company. In addition to information about these companies, the report details the traffic patterns on the Rideau and the volume and types of various commodities being moved on the Rideau Canal. This winter saw a major battle over proposed new fees for the Rideau Canal. In addition to cutting the budget of the Rideau Canal by over 20%, Parks Canada proposed to increase lockage fees by 200 to 400% and mooring fees by up to 233%. This proposal by Parks Canada provoked a huge public backlash – not only for the huge fee increases and unworkable nature of their initially proposed ticket system – but also because it would have severely impacted public use of the Rideau Canal. The public reaction forced Parks Canada to put forward a new proposal which included re-instating several of the passes and lowering the fee increases to “only” 43 to 70%. Mooring fees will be going up by 39 to 104% and proposals for increased commercial fees have been put on hold for the moment. Lockage fees, if approved, will be implemented in 2014. Mooring fees, if approved, will be implemented when approved in 2013. * On the Rideau Canal the only place a day mooring fee ($0.40/ft) is currently charged is at Colonel By Island. So in realistic terms this is new fee for the Rideau Canal. * The single lockage and return pass will no longer be available. A single lockage and return through a one lock lockstation will cost $0.60/ft each way (so $1.20/ft). A concern of Friends of the Rideau is the negative impact these fee proposals will have on the number of boats using the canal. Boats going through locks is the most significant part of the heritage presentation and interpretation of the Rideau Canal. Fewer boats means less opportunities for the public to see, understand, and appreciate the incredible engineering and heritage of our Rideau locks. Historic Canals play an important role in the story of Canada. As we know, the Rideau Canal is a UNESCO World Heritage Site, a Canadian Heritage River, and a National Historic Site. Unlike most National Historic Sites, historic canals can span great distances and have challenges and opportunities that are unique as a result of their location, the nature of their assets, and their operation. To ensure that they meet their full potential based on their collective strengths, a new organizational structure dedicated to canals has been established within Parks Canada. The new dedicated waterways structure includes the office of the Executive Director and two units - one for Ontario Waterways and one for Quebec Waterways. The Executive Director will be responsible for establishing strong direction for the historic canals in order to heighten their profile externally, share their professional asset management capacity and develop innovative approaches to address the unique challenges of our historic canals. The Ontario and Quebec Waterways Units will be focused specifically on canal operations such as navigation services, water management and daily maintenance of assets. Parks Canada looks forward to another year of sharing Canada's most treasured places with Canadians and visitors from abroad, and it is with great enthusiasm that Darlene Upton is welcomed as Executive Director of Parks Canada's Waterways Directorate, and Jewel Cunningham as Director, Ontario Waterways, which includes the Rideau Canal and the Trent-Severn Waterway. As Darlene breaks ground as Parks Canada's first Waterways Executive Director, she is no stranger to Parks Canada. In her 18 years with Parks Canada, Darlene has worked as a Park Warden at the Bruce Peninsula National Park and Fathom Five National Marine Park, as a Park Ecologist at Georgian Bay Islands National Park and as the Manager of Resource Conservation at Prince Edward Island National Park. Following this, Darlene became the Chief of Resource Protection and Operations in the National Parks Directorate at Parks Canada's National Office in Gatineau, QC. In 2008, Darlene took on the new role of Director, Law Enforcement, and led the establishment of the new Law Enforcement Branch and program within the Agency. Today, this program is recognized by other departments for its many best practices, and it is certain that the Waterways will benefit from the same dedication and passion that have become Darlene's hallmark. Darlene's office is located in Smiths Falls. As Director, Ontario Waterways, Jewel Cunningham is accountable for the effective stewardship of the Rideau Canal and the Trent-Severn Waterway. Jewel brings to this position 15 years of experience with Parks Canada in Marketing, Communications, Management of National Historic Sites, Field Unit Superintendent for Newfoundland East, Strategic Advisor to the Director General of Eastern Canada and, most recently, Field Unit Superintendent for Prince Edward Island National Park. Parks Canada is thrilled to welcome Jewel Cunningham to Ontario as she leads the Ontario Waterways Team into the future. Jewel's office is located in Peterborough.